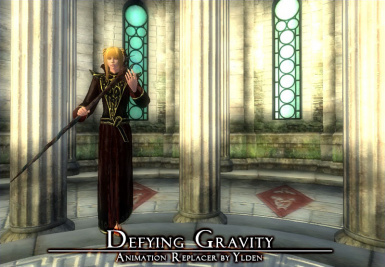 The last of my "procrastination" mods, Defying Gravity replaces staff animations to a floating one. Now staff wielding mages will get the awe and respect they deserve with their floating floatiness! Cower in fear as your staff wielding enemies levitate before your eyes! 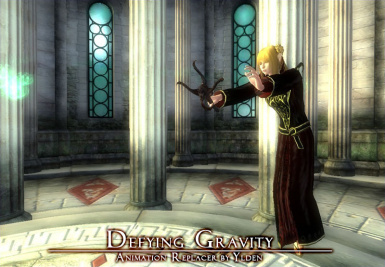 An optional animation set tweaks the vanilla casting so you'll be able to cast spells while floating (your staff out). Your Mileage May Vary. ^_^ I tried to make it less feminine as I can so male characters can use it, too. - Will naturally conflict with other staff animation replacers. Back up your old animations! - the optional cast tweaks will conflict with cast animation replacers. - Tail animations not yet included. Will work on it later. - I did not change the sneaking staff animations, so if you sneak while using staff, you will go back to walking. - Create an OMOD from the zip file. It has omod conversion data included. - Install. Follow automatic installation instructions. - Copy the meshes folder under Staff to your "Oblivion\Data". Overwrite when prompted. - OPTIONAL: For the cast tweaks, copy the meshes folder under Optional to your Oblivion\Data. - Deactivate OMOD. NOTE: If there were previous data conflicts with other mods I suggest reinstalling them to rollback to your previous animations. - Delete the following form your meshes\characters\_male folder. - If you installed the optional casting tweaks, delete the following. Conduit Magic - So you can change your staff magics on the fly! Highly recommended!